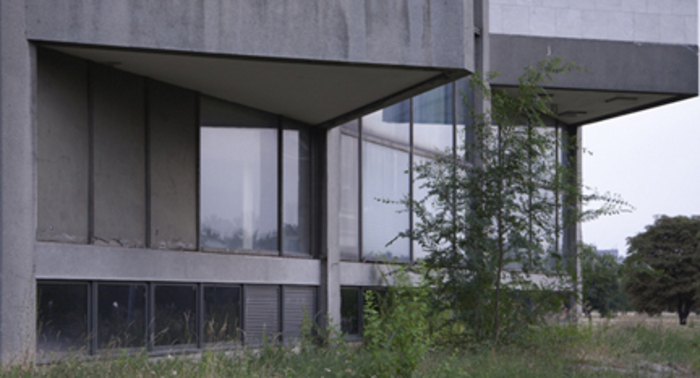 Ivan Antic and Ivanka Raspopovic, Museum of Contemporary Art Belgrade, 1965, exterior view. 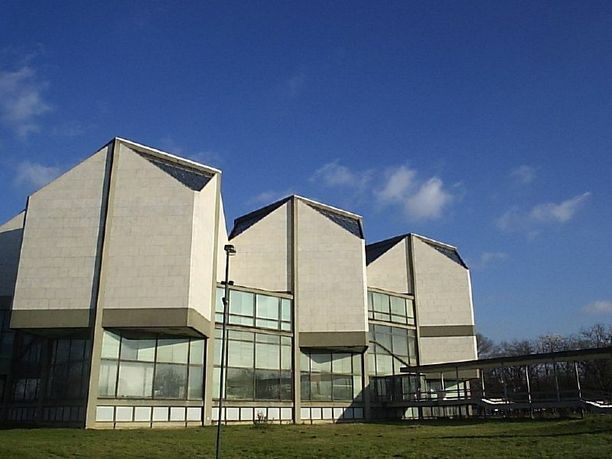 The Museum of Contemporary Art Belgrade (MCAB) was one of the first Eastern European institutions to feature modern architecture for the display of contemporary art. Closed since 2008, the museum sits in limbo, without funding for renovation and in danger of eradication by commercial forces. In an era of globalization, the ways in which art and architecture are implicated with politics, economics, and the possibilities for civic life are highly complex. Exhibition Povera is artist Irena Knezevic's strident proposition to confront these realities with a radical exhibition design process and system that ultimately re-asserts the civic role of art institutions. Using a re-creation of MCAB as a site of inquiry and commissioning architect Preston Scott Cohen, artist Aleksandra Domanović, and design studio HelloMe to respond collaboratively to its narrative framework, Knezevic enables a project wherein exhibition design becomes both form and content, where art, architecture, and design become inextricable. Trained as an architect, Andreas Angelidakis often switches roles between artist, curator, architect, and teacher. His multidisciplinary practice often takes the internet and the perceptive and behavioral changes it has brought on as its starting point. Angelidakis (b. 1968, Greece) lives and works between Oslo and Athens. He holds a BA in architecture from SCI-Arc and an MSc in advanced architectural design from Columbia University. Angelidakis has recently curated and designed The System of Objects, DESTE Foundation for Contemporary Art, Athens. 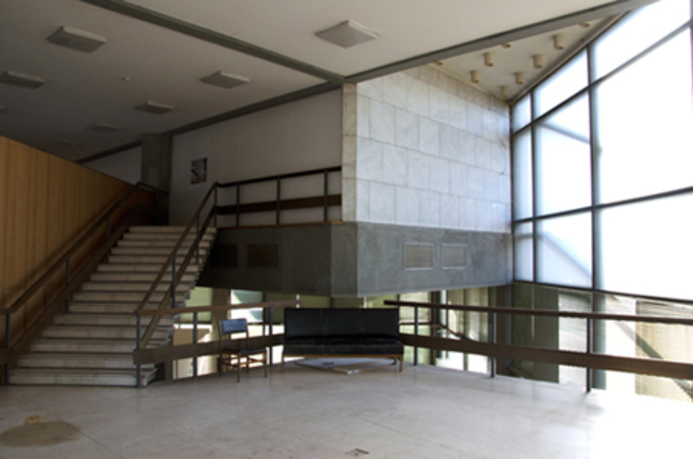 Among the exhibitions he has designed are the 3rd Thessaloniki Biennale (2011) and the 2nd Athens Biennale (2009). HelloMe is a one-person, Berlin-based studio focusing on art direction, graphic design, and typography. Founded by Till Wiedeck in 2008, the studio focuses on the conception and creation of distinctive dynamic visual systems, producing work based on research and creative thought that is driven by curiosity, originality, and innovative communication. HelloMe designs identity and branding systems, typefaces, magazines, books, catalogues, posters, music and product packaging, websites, mobile applications, fashion, textiles, spatial installations, interiors, guidance systems, and exhibitions. Recent exhibitions include Critical Objects, Galerie Quakatz, Berlin, 2012; This is Now, TM51, Oslo, 2012; Lyric Art: 200 Years of Warner/Chappell Music, Stolen Space Gallery, London, 2012; and The Mobile Museum, Salone de Mobile, Milan, 2011. Dubravka Sekulić is an architect focusing on the topics of transformation of public domain in the contemporary cities, commons and spatial justice, and spatial implications of technologies. Her books include Glotzt nicht so Romantisch! On Extralegal Space in Belgraade (Jan van Eyck Academie, 2012) and with Žiga Testen and Gal Kirn she coedited Surfing the Black (Jan van Eyck Academie, 2012) about Yugoslav black wave cinema. In 2012, with Andrej Dolinka and Katarina Krstić she cocurated Three Pillars of Support: Zoran Bojović at Museum of Contemporary Arts in Belgrade focusing on Bojović's African and Middle Eastern projects and their relation to the Non-Aligned Movement, the accompanying book was published in 2013. The exhibition was a larger segment of Sekulić's PhD research, "Construction of Non-Aligned Modernities", that she is conducting at the Institute for History and Theory, Federal Institute of Technology (ETH), Zürich. She collaborates with the Right to the City initiative in Zagreb and regularly lectures about her work. Lorelei Stewart, director of Gallery 400 since 2000, has organized over forty exhibitions, including the Joyce Award–winning exhibition Edgar Arceneaux: The Alchemy of Comedy . . . Stupid (2006). In 2002, she initiated the acclaimed At the Edge: Innovative Art in Chicago series, a commissioning program that encouraged Chicago area artists' experimental practices. Stewart recently served as interim director of the Master of Arts in Museum and Exhibition Studies Program at the University of Illinois at Chicago (UIC). She holds an MA in curatorial studies from the Center for Curatorial Studies at Bard College, a BA from Smith College, and a BFA from Corcoran College of Art and Design. Gallery 400, a not-for-profit arts space at the University of Illinois at Chicago (UIC), supports contemporary art, architecture, and design through exhibitions, lectures, publications, and programs that prioritize interpretative reflection and critical inquiry. Gallery 400's mission is to be a contemporary art hub for social interaction, transformative experience, and multi-dimensional learning. Creating a place to connect, Gallery 400 actively positions its exhibitions and public programs as opportunities with which to build community, and as avenues for learning in informal social settings. Since 1983, the exhibitions and programs hosted by Gallery 400 represent a broad range of recent developments and aesthetic concerns and have included more than 1,000 artists to date.